Booting is a process that takes from stating a computer into getting ready to use. So Booting time is the time taken for a successful Booting. Windows 7 can boot faster than previous versions like Windows XP. Windows 7 takes about 15-20 seconds for Booting, but Windows 8 takes only 10-15 seconds for Booting. That is Windows 8 boots faster than all other Windows versions. One day, one of friend called me for troubleshooting his computer. His computer was taking much time for Booting process, he waited about 1 to 2 minutes for completing Booting process and getting ready to use. He has no more idea about computer and its setting. So he installed much software without knowing how to use thm. Due to lack of his computer knowledge, he also installed many recommending and supporting programs with many installation setup. His installation was only ‘Accepting Terms and Conditions’ and ‘Next’, ‘Next’….. You know all we are not a computer troubleshooter or computer professional by birth, only experiences give us much knowledge about all things in this world. I changed some setting on his computer, and I restarted his computer, then his PC Booting time jump down into normal booting time up to 20 seconds. Now a System Configuration window will open. Now you can see many items as list. These items are software that will open automatically while you starting your Windows. Most of software will ask you whether their software need to run at startup or not. But lack of computer knowledge will accept this condition. So such programs will enroll on this list. So every Booting, windows has to run all these items at startup. This is the main reason of slow Booting. You know some of these items may be necessary for your computer. If you remove all these items, your computer will be work, but you may miss some functions like working of Wi-Fi, Bluetooth, Camera, etc. So we have to remove unwanted items only. Just read all items' name, if an item is related to any installed software, then just remove the tick mark (uncheck), Most of ‘Microsoft’, Sound, etc items are may be related your computer main functions. So do not remove them. After removal, Press OK button. Now Windows will ask you to restart your computer. It is better to restart computer now. Now your computer should be Boot faster than earlier. If you OS is Windows 8, then this option navigate you to ‘Task Manager’. Or just open your Task manager using one of these 6 ways. Then go to ‘Startup’ tab. Now right click on unwanted items and Disable them. Enable/Disable button is also there (right bottom). See what I Enabled and Disabled on my desktop computer (Windows 8). NB: if your computer is not performing any functions after this editing, just open this window again, and add to startup or Enable them to run again at startup. Don’t install software those you do not want to use. Another friend said to me, his computer has all popular software, but he has no idea about their usage even Photoshop. He also do not know why he installed those them on his PC. lol. 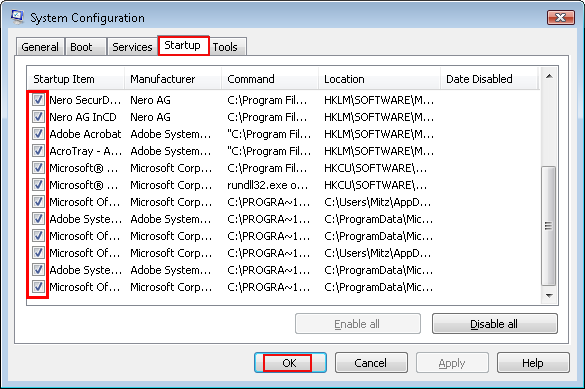 Remove the tick that indicates starting the program on startup. Don’t try to install a program that your anti-virus warned or blocked. Kеep on writing, great job! Peculiar article,јust wat I ᴡanted to find.